Germany: 1947-48 2 pf. brown-black, 16 pf. blue-green, 25 pf. orange, 60 pf. red, 80 pf. grey-blue and 84 pf green colour trials on card. 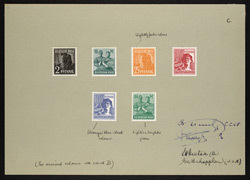 bl.uk > Online Gallery Home	> Online exhibitions	> Philatelic rarities	> Germany: 1947-48 2 pf. brown-black, 16 pf. blue-green, 25 pf. orange, 60 pf. red, 80 pf. grey-blue and 84 pf green colour trials on card.